The reservation status will be clearly indicated in your ticket. If your ticket is confirmed, your coach and berth numbers will be mentioned on your ticket in all classes other than First Class and AC First Class. For these, the word “Confirmed” will be printed alongside the class of travel. If your ticket is in RAC (Reservation against Cancellation)/Waitlisted status, the same will be mentioned on the ticket. Are there any other types of Reservation Codes? Below are different types of Resrvation Status Codes as can be mentioned on your Railway ticket. CNF/Confirmed: CNF/Confirmed means your Ticket is Confirmed. However in some cases Coach/Seat/Berth number will be available after chart preparation. RAC: RAC means Reservation Against Cancellation. This you can travel with a co passenger by sharing a single seat. In case, any confirmed traveler cancels his ticket, you get his seat. You can even travel in AC coaches with a RAC ticket. WL: WL means you are on the waiting list. Your ticket has not been confirmed for the given date. In case, you have a booked an e-ticket, it will be cancelled automatically after the chart is prepared. CK: CK means Tatkal (Priority) Booking. The difference between tatkal and general booking lies in the allotment of seat. You can book a Tatkal ticket 72 hours prior to traveling. You will find the confirmed seat and coach number (if confirmed) with the symbol “CK”. CKWL: CKWL means the ticket is Waiting under the Tatkal Booking. When a tatkal waiting is confirmed, you get a confirmed personal seat, where as with general reservation, your ticket moves in the RAC category. GNWL: GNWL means General Waiting List. You cannot travel without the ticket coming with CNF status. If booked from a station, you may travel in the general compartment in some cases. PQWL: PQWL means Pooled Quota Wait List, which refers to waiting status when a ticket is booked through a railway quota. REGRET/WL: REGRET/WL means No More Booking Permitted. Ideally, this appears when you are booking your ticket and no more booking are allowed. CAN/MOD: CAN/MOD means Ticket is Cancilled or Modified. This appears when your ticket is modified or cancilled after the initial booking. The current status of your ticket can also be obtained from the following link PNR Status. What are the various classes of travel and their codes? What Document/I-Card are required while traveling ? The user is not required to give any input of the photo identity card details of any of the passengers while booking the ticket. However he shall have to carry an identity card of any of the passengers in original while traveling. W.E.F. 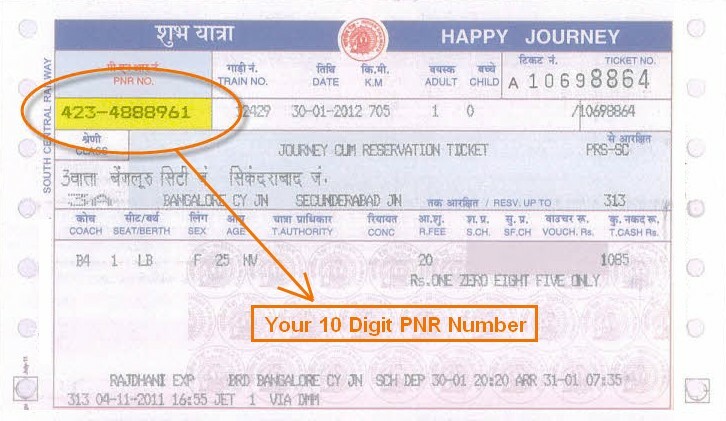 01-12-2012,any one of the passenger booked on a PNR for undertaking journey in any class will have to produce any one of the 10 prescribed proofs of identity in original) during the journey failing which all the passengers booked on that ticket will be treated as traveling without ticket and charged accordingly. 01. Voter Photo identity card issued by Election Commission of India. 03. PAN Card issued by Income Tax Department. 04. Driving License issued by RTO. 05. Photo identity card having serial number issued by Central/State Government. 06. Student Identity Card with photograph issued by recognized School/College for their students. 07. Nationalized Bank Passbook with photograph. 08. Credit cards issued by banks with laminated photograph. 09. Unique Identification Card “Aadhaar”. Attested photocopy of ration card with photograph and nationalized bank passbook with photographs shall also be accepted as a prescribed proof of identity only in case of reserved tickets booked through computerized passenger reservation system (PRS) counters, for undertaking journey in sleeper (SL) and second reserved sitting (2S) classes. the photocopy of the ration card with photograph and nationalized bank passbook with photograph should be attested by gazetted officer or the chief reservation supervisor or station manager/station master. The above provision is not applicable for all classes of e-tickets & tatkal tickets and tickets issued through prs counter for traveling in air-conditioned classes and first class. traveling with these categories of tickets shall continue to be governed by existing instructions.